The outer membrane was pale and washy and is now receiving a more vivid green colour. Fans welcome the move with enthusiasm, though ticket demand for Bursaspor’s Timsah Arena is poor. 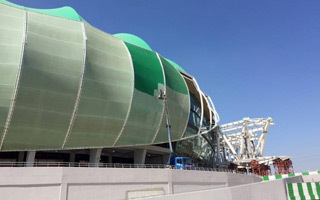 Earlier this year the membrane façade cladding of Timsah Arena in Bursa was installed and caused real outrage. Faded green segments were nowhere near the colour promised in renderings, nor the one visible throughout the stadium’s roof. Now things are changing. Beginning last week, the PTFE mesh is being painted with a lot more vivid green paint. As of yesterday evening only 4 panels were painted, but already the reactions of supporters are very positive. This upgrade comes along many other minor renovation and repair works at Timsah Arena, which revealed numerous deficiencies during its opening season. Bulk of the work is expected to be done before the 2016/17 season begins on August 21. One thing that surely won’t be ready by then is the construction of northernmost part of Timsah Arena, the large crocodile head. Work on this part of the stadium has been suspended for months. Interestingly, Bursaspor is finding it extremely difficult to attract supporters to the new stadium for 2016/17. While they are among the most popular clubs in Turkey, they only sold some 4,700 season tickets for Timsah Arena since the open sale began on May 30! Turkish fans are continuing their battle against the Passolig fan ID system, though the number of cards sold is growing nationwide.